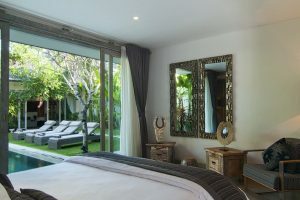 Villa Mia is a luxurious three bedroom villa located in the heart of the sensational Canggu area. 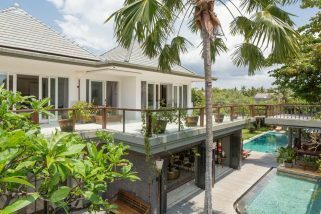 Located just off Jalan Pantai Berawa, this villa is within proximity to the beach, the best bars, cafes and restaurants on the island. 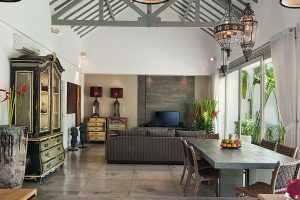 The villa can accommodate a maximum of 6 guests and this makes it the perfect choice for a group or family looking to enjoy the best island holiday in Bali in luxury, comfort and style. 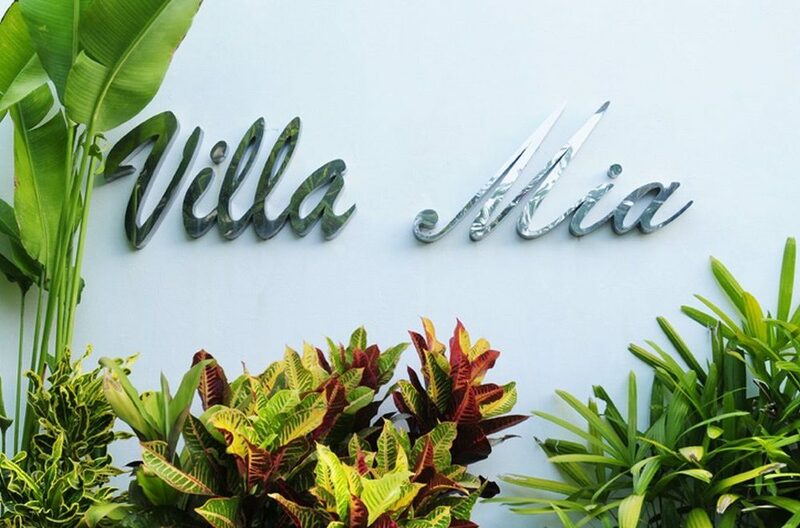 On walking into the compound of Villa Mia, guests are simply wowed by its simple elegance, pervading serenity, ample space and lush vegetation. A stone path leads from the gates right through the lush lawn dotted with trees, flowers and frangipanis, to the gorgeous rectangular pool which is right in the middle of the villa. 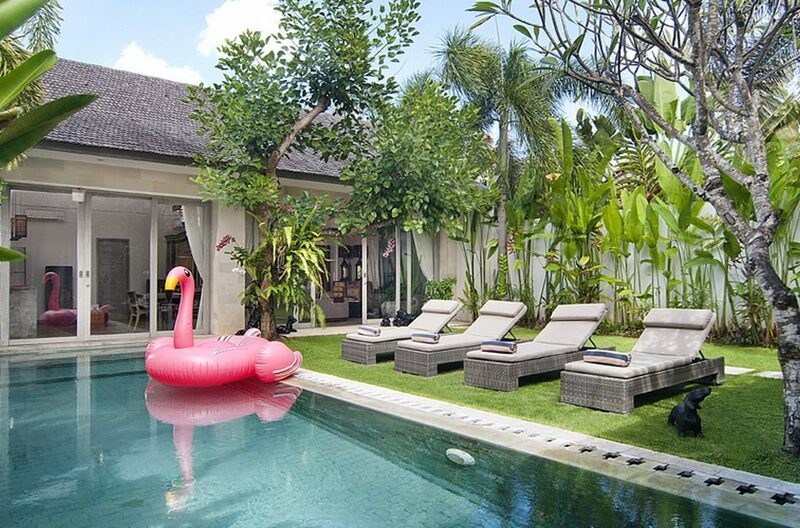 On the lawn beside the pool ate several lounge chairs where guests can sprawl out and soak up some sun after enjoying a refreshing swim in the pool. 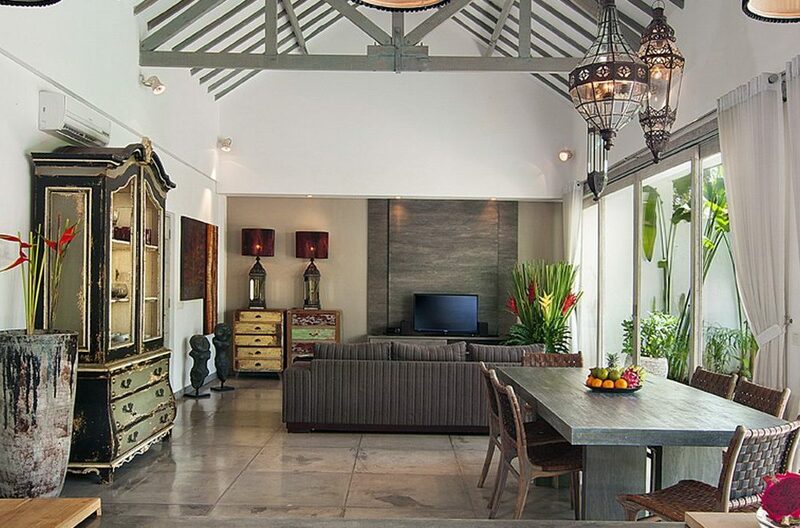 Villa Mia boasts of a stunning open plan living area whose décor is the perfect fusion of traditional Balinese beauty with modern day comfort and elegance. 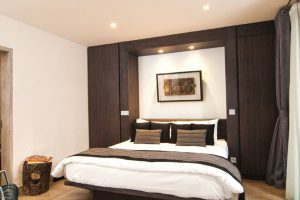 The living room is furnished with a comfortable sofa set arranged to face the flat screen TV, beautiful wooden cabinets, several potted plants and stunning paintings on the wall. 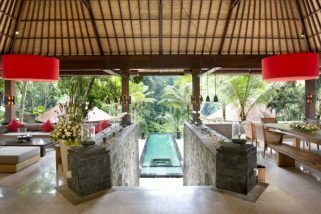 Behind this is the dining area which is furnished with a six person dining set where guests can sit and enjoy fine dining right in the comfort of their villa. 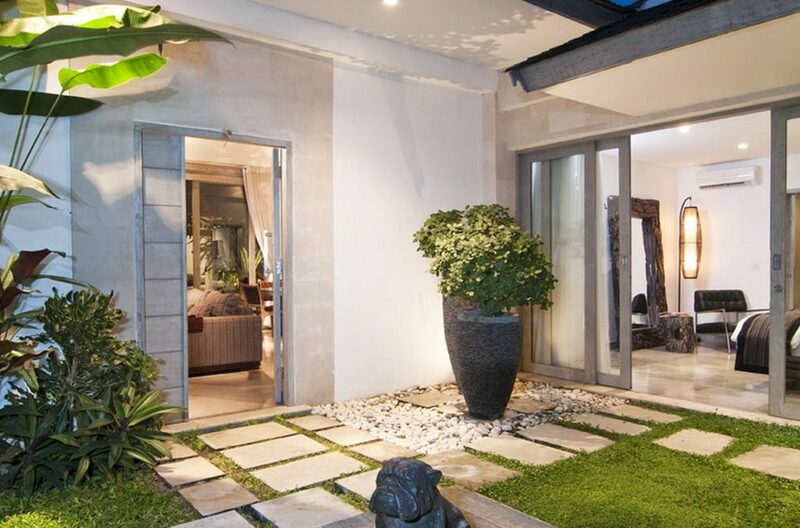 Sliding glass doors lead out from the living area to the outdoor area, affording guests both direct access and stunning views of the outdoor area. 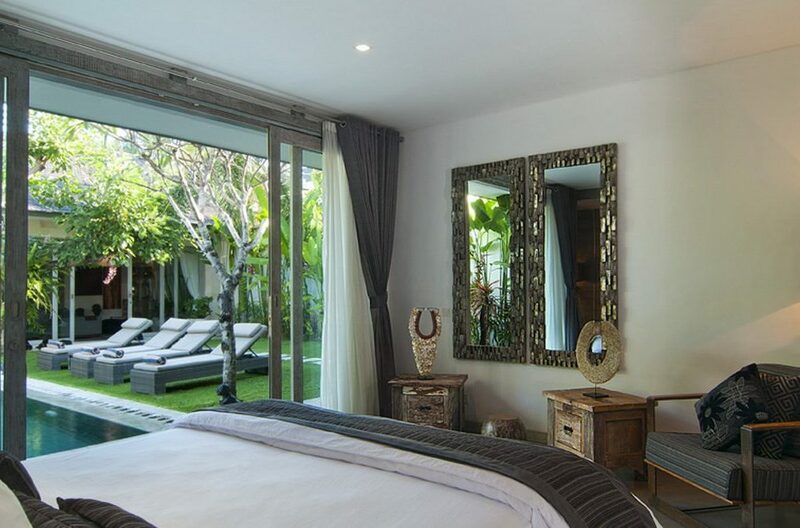 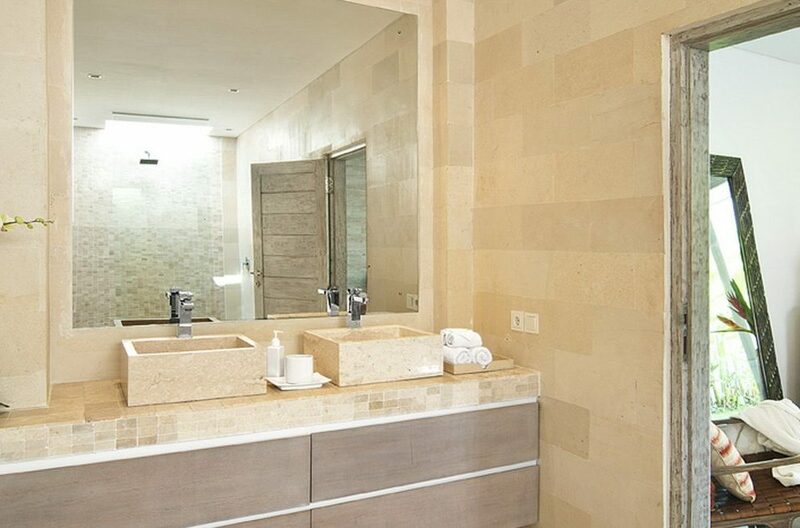 Villa Mia boasts of three stunning bedrooms, each one comfortable, spacious and luxurious. 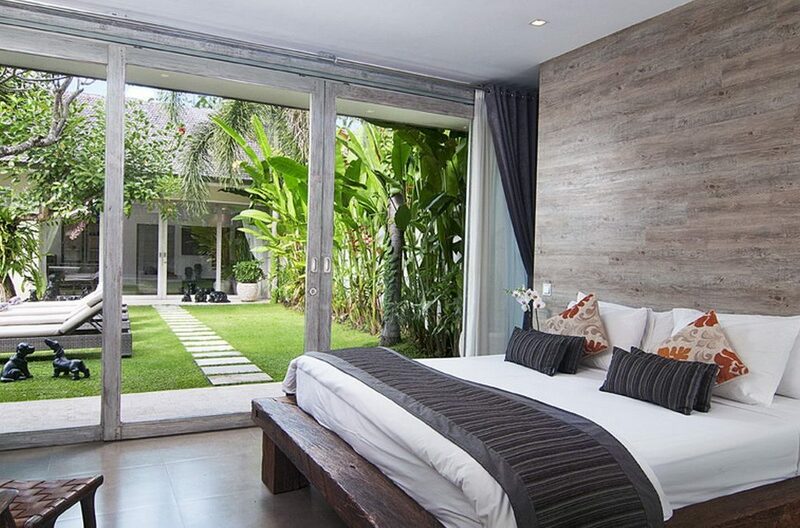 In each bedroom, there is a queen bed, easy chair, beautiful wooden furniture and miniature Balinese sculptures. 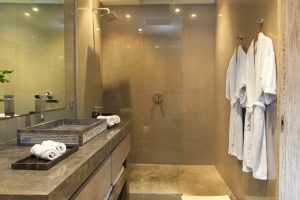 Each bedroom also has an ensuite bathroom which boasts of rainforest showers, ample storage and space. 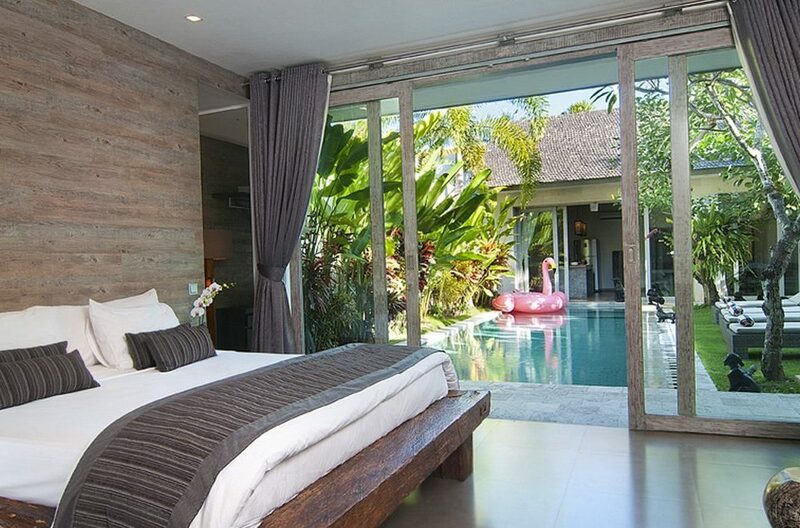 From the bedrooms, sliding glass doors grant guests direct access to the garden and pool area. 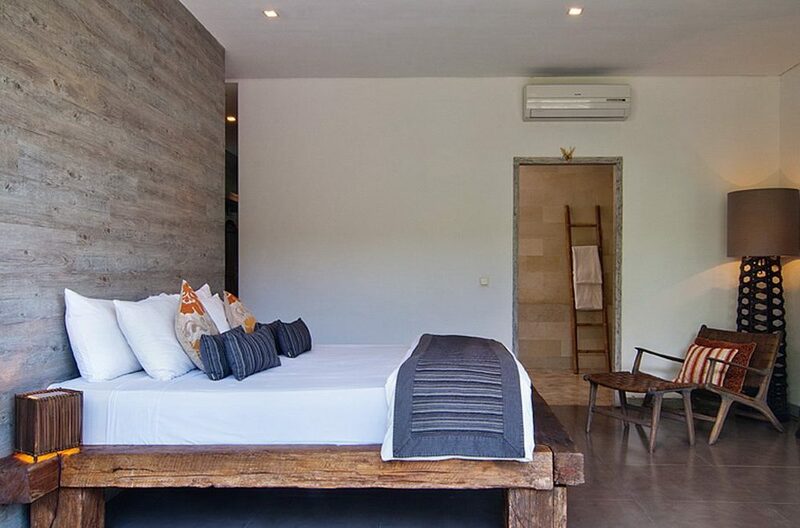 After an exciting day spent exploring the island, the bedrooms of Villa Mia will ensure that guests get the rest they deserve. At Villa Mia, guests enjoy the services of a villa manager, daily housekeeping, pool and garden attendants, and security. The villa also have kids’ friendly furniture like a high chair and cot. 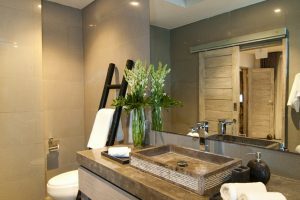 The staff is pleasant and readily available to help with anything, ensuring that your stay is comfortable and pleasant. 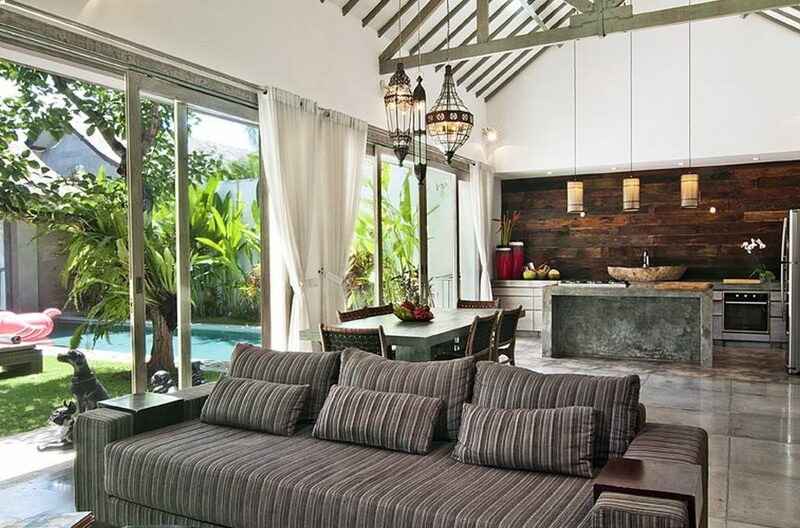 Within proximity of Villa Mia is all the best places in Canggu, including fancy restaurants, chic bars and cafes. 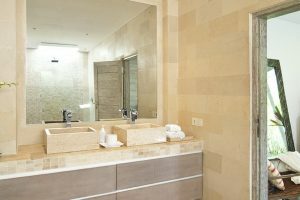 Guests will definitely enjoy dining at Milk and Madu Café or La Laguna, and just across the villa is a grocery store where guests can get all the necessary supplies they would need during their stay. Additionally, Batu Belig Beach is less than 15 minute walk away from the villa and there, guests will find the Finn’s recreation club, Finn’s beach club, Potato Head beach club, etc. 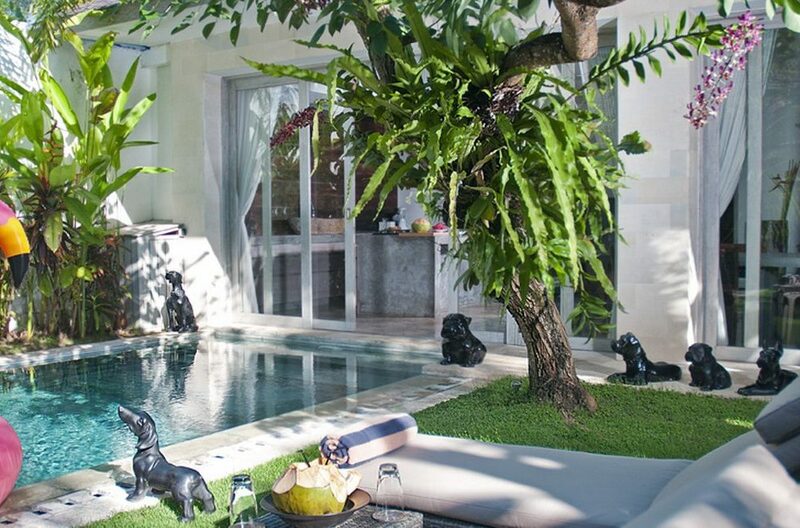 Given the how close the villa is to all the hotspots on the island, guests will definitely not be at a loss of things to do while they enjoy their island holiday in Canggu. 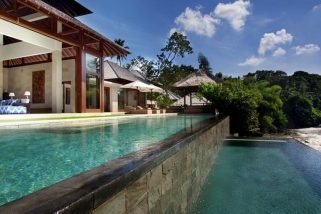 Situated on 30,000 sq mtrs, Villa Sanctuary sits on a small river with jungle views, Pavilion style buildings.